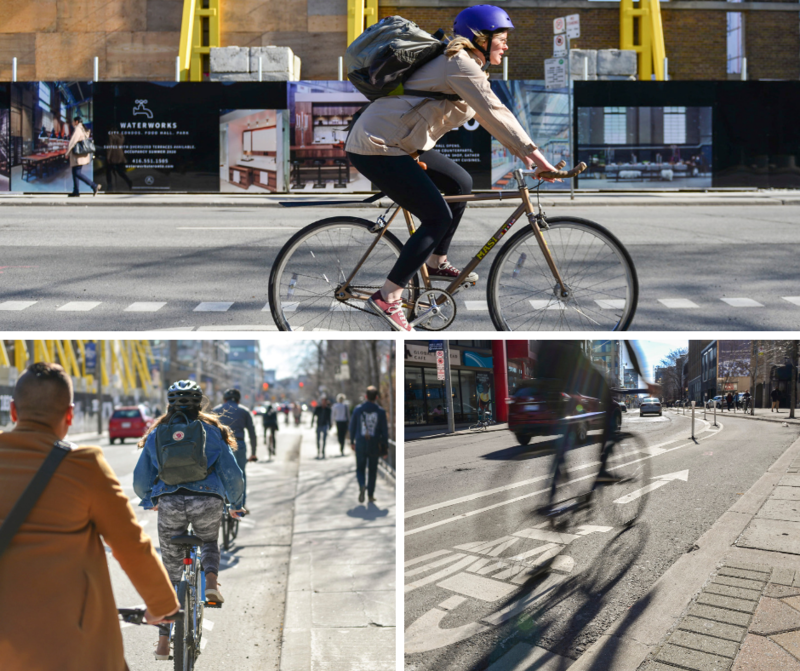 Earlier this month City staff recommended making the protected bike lanes on Richmond, Adelaide and Simcoe into permanent facilities. This recommendation includes moving the Adelaide cycle tracks to the north side of the street to address concerns about obstructions on the south side of Adelaide, particularly in front of First Canadian Place and Scotia Plaza, forcing people biking to merge with motor vehicle traffic. Ridership along Richmond and Adelaide has skyrocketed: cycling volumes have increased by 1,194% along the busiest part of the route, west of University Ave. While we’re supportive of the proposed switch to the north side in principle, we have questions about intersection design. Especially with a new design, it’s essential to ensure that the permanent design provides a continuous, safe corridor for people biking and walking. There’s potential for conflict given that there’s no other configuration like this in Toronto. We also urge the City to ensure that the design reduces conflict around parking garages on the north side of Adelaide. Looking ahead, we’re advocating for high quality separation using concrete curbs, jersey barriers, or planters, as well as applying green paint through intersections.